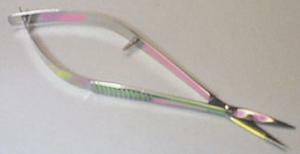 Easy Kut spring action scissor with a curved blade for easier cutting! Use for embroidery, cross stitching etc; ergonomic ambidextrous design made of light weight high grade stainless steel, reduces hand fatigue, while snipping threads smoothly. Rainbow Titanium Oxide finish. You will LOVE using them!